Python skin; leather lining, buckle, no appliqués, narrow toeline, laminated effect, multicolour pattern, flat. 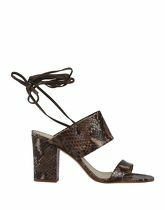 Heel height 3.51 inches; Soft Leather; leather lining, lacing, snakeskin print, round toeline, leather, two-tone, square heel. Soft Leather; leather lining, buckle, no appliqués, narrow toeline, suede effect, solid colour, flat. 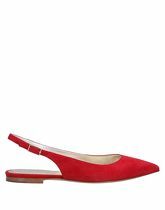 Heel height 4.29 inches; Soft Leather; leather lining, square toeline, no appliqués, square heel, leather, solid colour, covered heel. 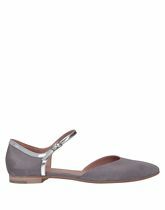 Soft Leather; leather lining, buckling ankle strap closure, no appliqués, narrow toeline, suede effect, solid colour, flat. Iguana leather, Soft Leather; leather lining, buckling ankle strap closure, no appliqués, round toeline, laminated effect, multicolour pattern, flat. 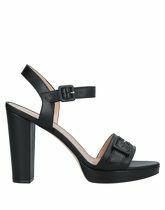 Heel height 4.68 inches; Platform height 0.98 inches; Calfskin; covered heel, buckle, buckle, round toeline, leather, solid colour, square heel. 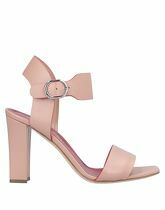 Heel height 3.51 inches; Soft Leather; covered heel, wrapping straps closure, no appliqués, round toeline, suede effect, solid colour, square heel.